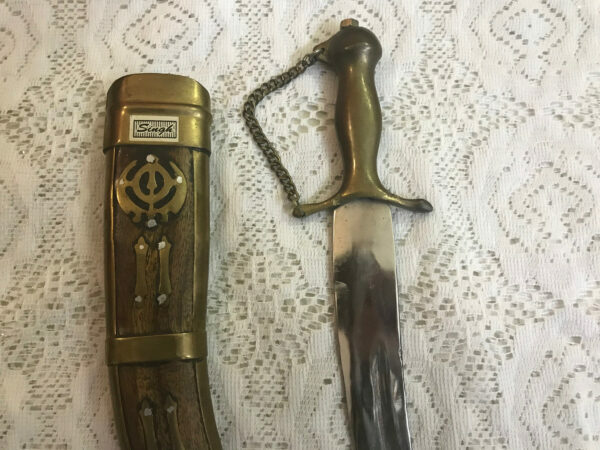 A Kirpan is one of the five articles of Sikhism- a religious commandment given by Guru Gobind Singh, the tenth Sikh Guru. The first one is Kesh, uncut hair, second is Kara, a steel bracelet, third is Kaccha, cotton underwear, fourth is Kanga, a wooden comb, and finally, the fifth is the Kirpan, steel sword. 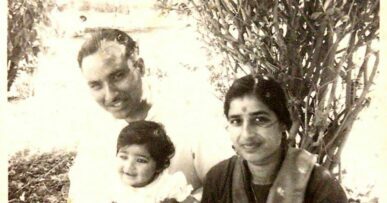 My nani was a victim of the Partition and went through a lot. She was very young, maybe five or six years old, when she had to flee from her home and move to Delhi. She was born on 5 January but we are not sure about the year of her birth. 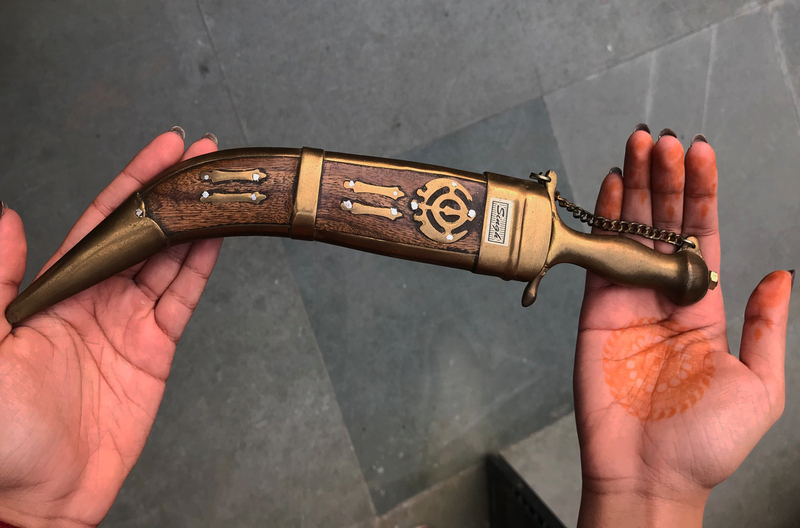 She bought this Kirpan from one of the vendors outside a Gurudwara in Daryaganj where she lived after marriage. 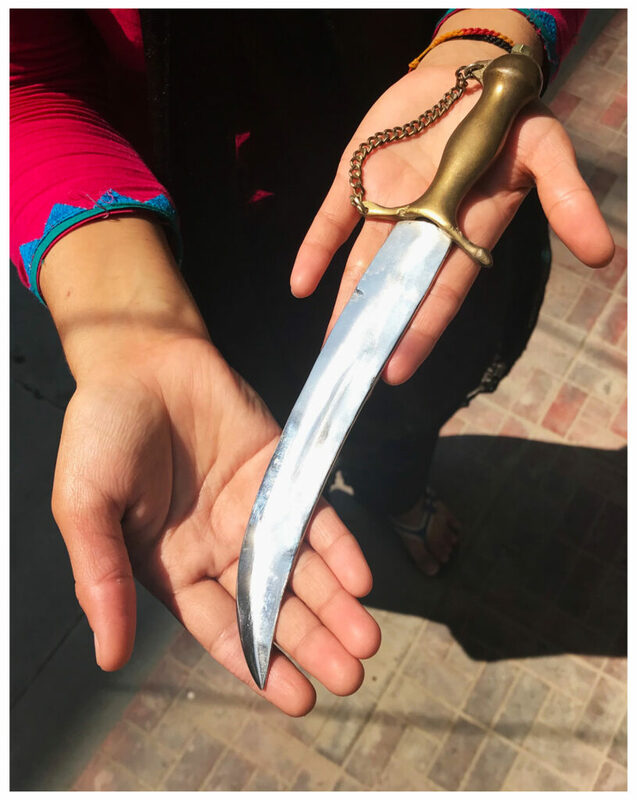 This Kirpan was her safe place from all that she saw and made her feel strong and confident when she used to travel alone in DTC buses or with people. It gave her the courage to move ahead in life and instilled her courage in the people around her. I remember how she looked after it, cleaning it every night with a lot of care. My grandmother gradually learnt how to be strong due to the events that transpired in her life. 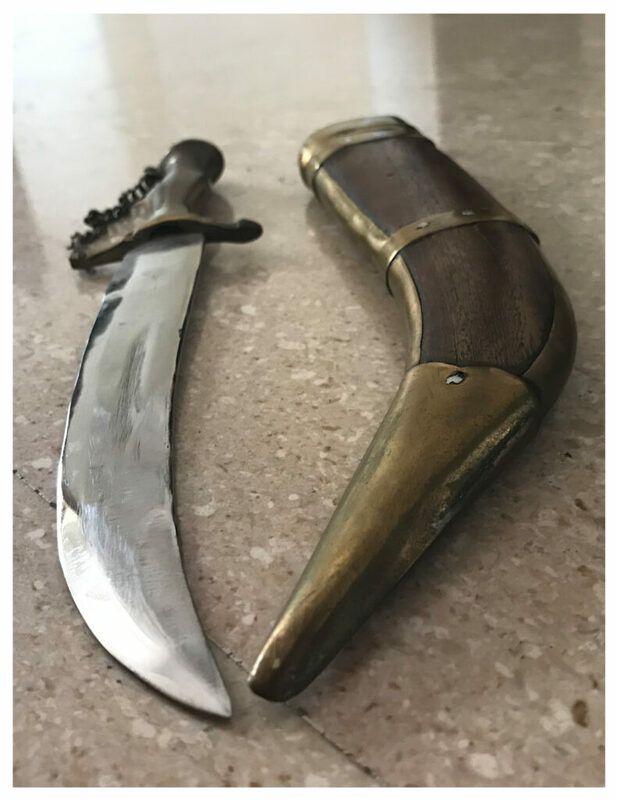 The Kirpan is curved and has a single cutting edge that is sharp. 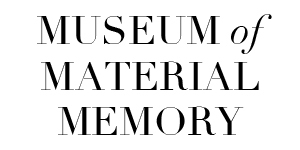 It is nine inches long and is made of steel. It has a wooden cover with a chain that hangs from the handle to support the handle. The wooden cover has borders of gold plated metal and a design in the centre with the symbol of Sikh faith on it which is known as the Khanda. 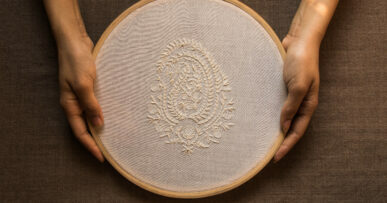 The Chakkar, like the Kara is the circle representing God without a beginning or an end and reminding everyone of the Sikh faith to remain within the rule of God. Two single-edged Kirpans (swords) crossed at the bottom, sit on either side of the Khanda and Chakkar. They represent the dual characteristics of spiritual and temporal sovereignty together and not treating them as two separate and distinct entities. It consists of three weapons and a circle: the Khanda,two Kirpans and the Chakkar which is a circle. This is the military emblem of the Sikhs. The cover has a sticker labelled ‘Singh’ on it which is of the vendor from whom it was bought. I feel that living through the Partition made my grandmother quite modern. She was a very headstrong and independent woman who liked doing all her work herself. From cooking, to dusting her room to traveling, she did it all on her own and was very particular about everything. She had a very modern approach to life and women’s rights especially. She did not believe in stereotypes. 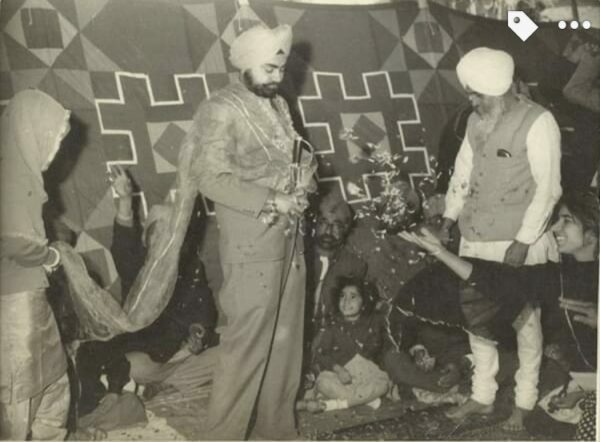 Nani belonged to a Hindu family, Gulati, and married my grandfather, a Sardar (Sikh man), Sukhdev Singh Boora. 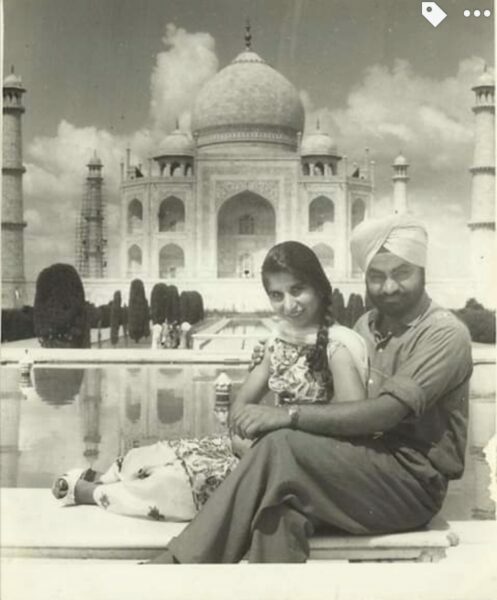 Shanta Boora with her husband Sukhdev Singh Boora at the Taj Mahal in Agra. Nani was always very stylish and designed her suits on her own. She had a matching shawl for every suit during the winters. A woman of grace and elegance, she wore the most stylish suits, donned the boldest hairstyles, put on a nice light lipstick or sometimes a vibrant orange and look fabulous. She was a woman true to her words and extremely dignified. 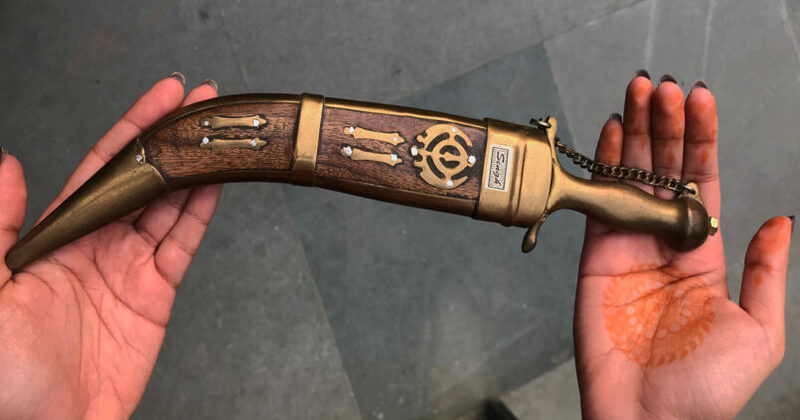 I was 8 years old when I saw this Kirpan for the first time. 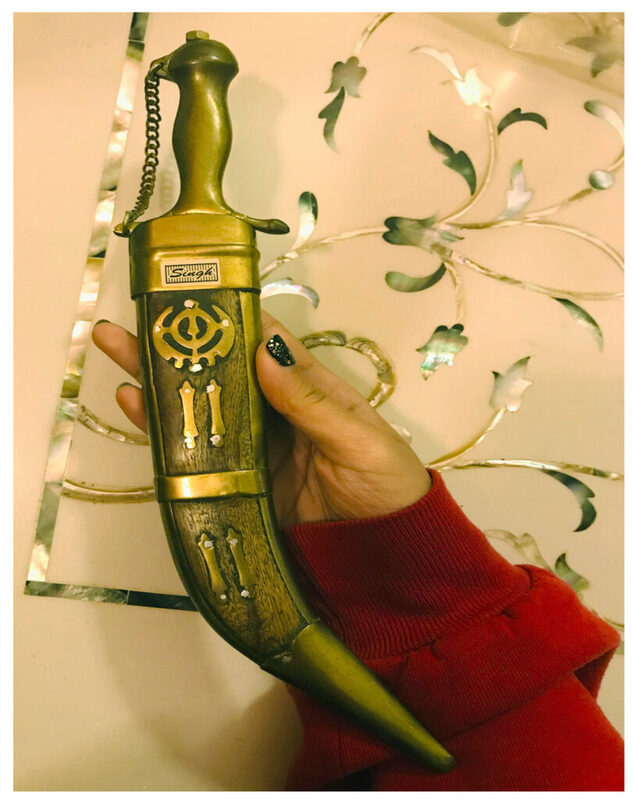 For me this Kirpan is her essence because of the way she held it quite firmly, close to her heart and the sparkle in her eyes while talking about it. 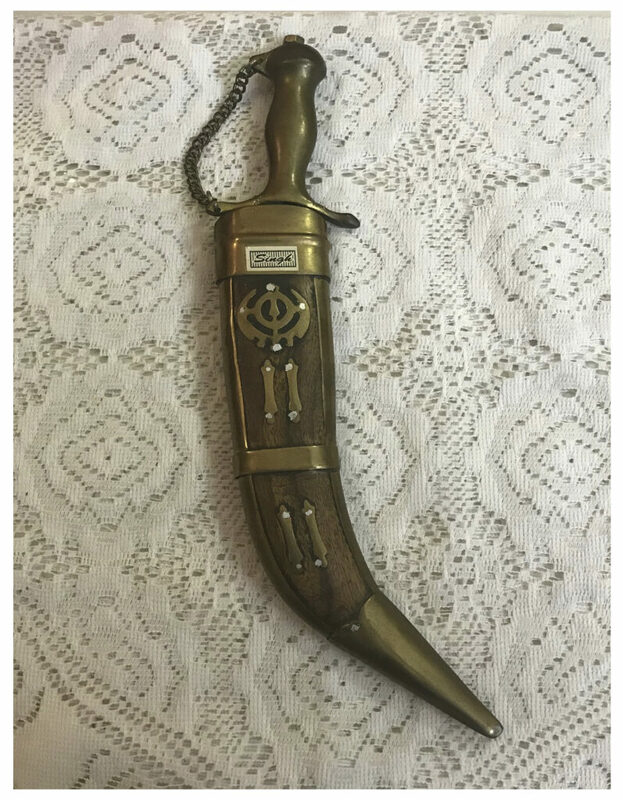 The Kirpan remains the same as I saw it for the first time all those years ago, in her hands. After my nani passed away, my mother kept it with her as a part of her mother’s memory. A month ago, she gifted it to me and asked me to keep it on my bed’s side table so that it is close to me when I am sleeping. It reminds me of my nani whenever I see it. The metal of the Kirpan still smells so clean, the way it used to when it was with her. I make sure I clean it properly, following her rituals every night before I sleep. It gives me a sense of protection and comfort that I believe my grandmother is providing me from up there and always will. It will forever remain an important part of my life and existence, which shall be passed on to the coming generations of my family. During my childhood, I often wondered of its significance, now as an adult, I am cherishing the emotions behind it and in my old age,I hope to find a new meaning in it.